“The Blue Earth Dream: Eco-living with SAMSUNG mobile”! The Korean electronics giant has again set a new milestone in the mobile phone industry by introducing its Blue Earth solar powered phone. This environmental and eco friendly phone is made from recycled plastic extracted from water bottles called PCM. By using this recycled material, fuel consumption and carbon emission in the manufacturing process can be reduced. Besides, Samsung has highlighted that the phone together with the charger is free from harmful substances such as Brominated Flame Retardants, Beryllium and Phthalate. 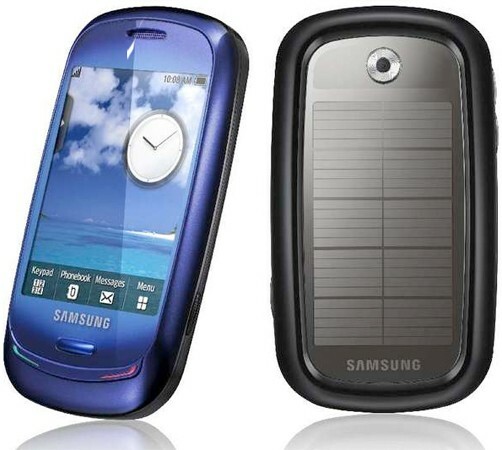 The Samsung Blue Earth phone features a solar panel at the back of the phone where users can via the solar panel generate sufficient electronic power to operate the phone. The phone also features a so called “Eco Mode”. This energy-efficient mode will adjust screen brightness, backlight duration and Bluetooth usage to an optimized mode and reduce energy consumption substantially. In addition, there is an additional “Eco Walk” app which functions as a built-in pedometer to measure and calculate how much CO2 emissions have been reduced by walking as opposed to taking the car. This Blue Earth environmental friendly phone is the first solar powered phone available. Samsung will showcase it at the Mobile World Congress 2009 in Barcelona. Overall it is an interesting idea which helps to preserve the world. From an aesthetic point of view, this “green” phone in blue is a bit bulky and thick compared to other more elegant and compact looking phones. This new phone is expected to be available in the market in the second half of 2009.